Tolal Max. Capacity, GPM, bolh sides: 1000"
The units employ the most effective techniques and equipment currently being used in the search for hydrocarbons. (Services available only in West Texas and Central U.S.A.). IMCO's 3-D Shaker takes solids control one step further than ordinary equipment. It utilizes three fine mesh screens for more precise solids control and sampling. 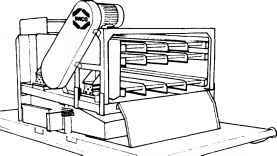 The 3-D Shaker has hydraulically controlled screen bed tilt which allows a variation from zero to 13 degrees. This affords versatility in handling fluid flow rates with varying viscosities and a faster gravitational pitch of cuttings over screens. Screens may be rapidly changed by one man in 15 minutes or by two men in half this time. 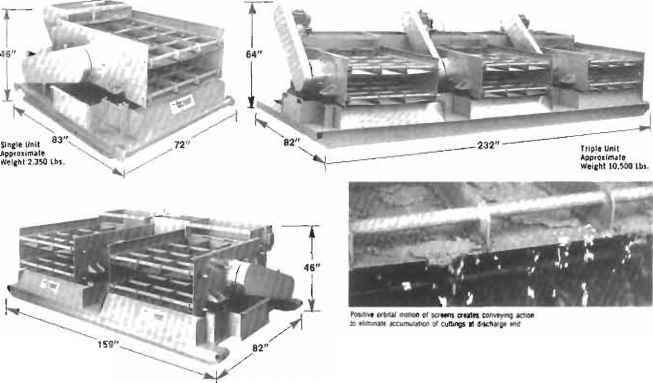 Other features of the 3-D Shaker include a positive bypass gate which can handle any volume of fluid, hinged mud control gates which regulate flow of muds to the screens, Aero-Union type mud box connections which minimize rig-up time for flowline connections, an underslung design feature which extends screen life and heavy duty all-welded construction with a rubber mounted screen bed on an extra heavy base which provides exceptionally quiet and efficient operation. The IMCO Mud Gas Separator is a low pressure vessel similar in design to gas separators used in production. Its function is the removal of large volumes of gas from the drilling fluid during the drilling operations. The gas is then vented away from the drilling rig for burning. The unit is capable of handling 20 million cubic feet per day and is designed for maximum flow—maximum safety. The IMCO Mud Gas Separator has a surge pot which allows gas to expand before entering the main vessel and is equipped with adjustable legs for gravity drainage. The unit has a 6 inch flare line. The IMCO Desilter utilizes 16 four-inch desilter cones for highly efficient removal of silt sized particles from drilling fluids. 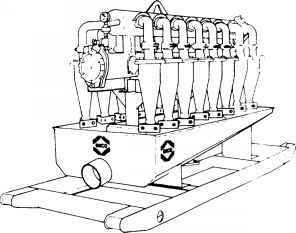 The Desilter Unit and the Power Unit are both skid mounted with the Power Unit being available with either diesel or electricity. The IMCO Desilter, equipped with a centrifugal pump, is designed to operate optimally with rates up to 800 gpm. For additional capacity, a second unit may be added. RVS is the new name for the fine screen shale shaker we manufacture and market. RVS stands for "Rotary Vibrating Shaker." Its unique drive system develops 11,000 lbs, of thrust to handle exceptionally-high mud and cutting volumes. There are no belts, chains, or gears...so there's no down-time to service them. The shaker screens are in a series on a sloped bed where a torn screen can be quickly replaced. The RVS will handle flow rates in excess of 900 gpm with no sacrifice of cleaning efficiency. Transportation and installation are easy, because the RVS is designed to break down into two sub-assemblies for fly-in rigs. Its rugged welded construction and dimetcoating make the RVS suitable for any environment. From Gulf Coast Offshore to the Arctic Circle—from California to the North Sea and Middle East—from Soulh America to Singapore, customers are using our shaker because from gumbo to hardrock cuttings and sand, the RVS outshakes them all. Available in single, dual, and triple models. Milchem's Rotor Mud Separator RMS is the only centrifuge on the market designed specifically for use with oilwell drilling muds. The RMS simply, effectively, and economically removes undesirable, low gravity solids from the drilling mud system. It at the same time reclaims high percentages of barite at high flow rates. The RMS has a greater throughput mud volume capacity than any other centrifuge on the market. Unlike any decanting centrifuge, the RMS does not depend upon gravity to recover the underflow of high density solids. A complete, self-contained pumping system enables the RMS to pick up mud to be centriluged from a fixed position from as far away as 25 feet. Both the effluent and the underflow are discharged under pressure and can be transported as much as 50 feet from the unit. The RMS is available in a trailer mounted configuration to facilitate ease of transportation. The total Mllctiem concept embodies the RVS (Rotary Vibrating Screen) SHALE SHAKER, the RMS ROTOR MUD SEPARATOR, and the DESILTER...deslgned to work together to cut costs of rig operation in any environment. The Milchem Desilter offers the operator an inexpensive, efficient method of removing undesirable, low gravity solids (as small as 10 microns) from an unweighted drilling fluid system. The average unweighted mud system can be maintained at mud densities of less than 8.8 pounds per gallon if proper application of the desilter is utilized. 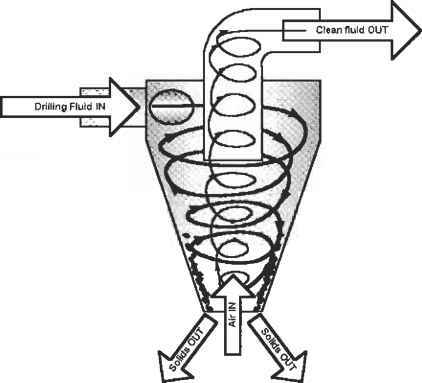 A planned program of utilizing the Milchem Desilter to process both the active drilling mud system and the excess mud located in the sump more than justifies the investment in this equipment. During trips the desilter can be used to process the sump mud. By recycling this mud through the equipment several times, the effluent water can be reduced to a mud weight of as low as 8.6 pounds per gallon. This effluent contains almost an equivalent concentration of chemicals as are contained in the active system. Usually Ihis water, containing drilling mud chemicals, can be added to the active system as needed to build volume. This program can reduce the sump volume by as much as 75%. The Milchem Desilter is available in sizes ranging from 4 to 16 cone units. Fabricated from Schedule 80 steel, the manifold is designed to last for years. Power skids are available with either diesel or explosion-proof electric motors sized to process maximum volumes. 6300 Midvale Houston. TX 7701? 0u*l Unit ippiommale WeljhI 5.550 IM. The lu^ii flow rale ami positive solids control you jret with Hi it111it Tandem Screen Separators ;ij-i■ tile result ill' ilie preferred horizontal screen atti-tlido ami positive orbital runtnm ¿it all points on tile screens. So] ids move off at a constant. rate. Accumulations are eliminated. A wash system is seldom needed, brandt Tandem Scree!) 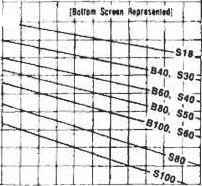 Separators have demonstrated higher flow rales with all types of mud than other well known separators. The horizontal screens allow longer slurry retention tiim1 and provide more volume sq, ft. of screen than i;ip:h-anjik .separators. T.he tandem screen feature increases ilie volume si], ft. of the lower screen and maintains a more Constant flow rate tlian other designs over a wale ranj:e of drilling ¡-ales. The lop screen removes larjie solids which otherwise would reduce the How rate of the fine mesh lower screen as the drilling rale increases. The low profile of Hrandt Tandem Screen Separators allows units to he used wiili low substructure rigs. Weir height is only :! I". Standard .size screens ( I' \ . 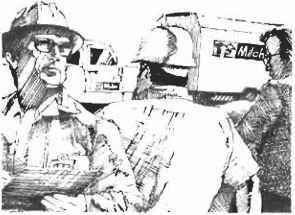 "/) can be obtained through oilfield supply stores. Kitl.er sci-een can be changed in lew than ■"> minutes due to one tension liar briny fixed permanently and the other beiiifr adjustable. Standard motors, belts, sheaves are used. Xo delicate alinrimimls are necessary. Skid-mounted units are sand blasted to white metal, prime-coated wilh inorganic zinc and finish coated wit.li epoxy. Junior Tandem units for workovet* and low volume drilling also are available. Jjnior Unit* ana Hijh CJDKlty Standard! ilia ire ivilUDIe. tural parts reduce adherence and accumulation of mud on machine surfaces. How does a shale shaker work?